The "little tough guy" Francisco Ra�l Grillo was born in Florida of Cuban parents who returned to Cuba. Arriving in New York City in 1937, he played in the Xavier Cugat and Noro Morales orchestras before starting his own band. In 1940 his brother-in-law Mario Bauz�, jazz trumpeter and arranger-composer extraordinaire known for the standard "Tanga," joined him and stayed for the next thirty-five years. At first, Miguelito Vald�s handled the singing duties, but Machito and his sister Graciela became the chief vocalists. Machito and his Afro-Cubans, including Bauz�, Ren� Hern�ndez, and Chico O'Farrill, along with Dizzy Gillespie, played a pivotal role in the acceptance of Latin rhythms by American jazzmen. These top arrangers were attuned to the leading big bands of the day and rivalled them while breaking new ground in Latin and Latin jazz. 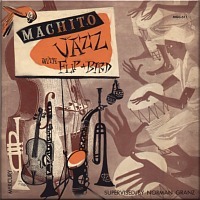 This led to an association with Norman Granz, whose recording "experiments" with Machito and Charlie Parker and others became historic achievements. Machito and his Afro-Cubans also performed compositions by Chano Pozo, Obdulio Morales, and others. In pre-War years as well as later, as one of the Tico artists, Machito brought important Latin works and musicians to wider acceptance. His sister Graciela appears consistently as lead female vocalist. Tito Puente, Chino Pozo, and others learned much about the business during stints with the band. WWII took away Puente and Pozo just as some Mario Bauza was coming up with some of their most important breakthroughs. (1943's "Tanga" became the anthem of a new idiom, Afro-Cuban jazz.) Further, Machito's orchestra backed singers on many labels, including Coda and SMC, often without credit in observation of contractual obligations. Over the decades Machito maintained his jazz sensibility while doing the Latin dance-orchestra duty. He scaled back the band to an octet to tour but reformed the Afro-Cubans in 1981. (As with the posthumous Xavier Cugat Orchestra, Machito's band continued after his death in 1984.) While later Latin rhythms such as cha cha cha and mambo all were in Machito's bag, his fame rests on playing Afro-Cuban (rumba) and establishing Latin jazz. Buying: Machito's Afro-Cuban jazz from any period is hard to beat, and shades of it usually turn up even in his more mundane Latin dance-orchestra LPs. Collectors prize the early Norman Grantz productions and any 78 on the rare Verne label. But the early Tico, Decca, and off-label records also are great collectors items and usually have great sound. Anyone can appreciate the Cotique and Tico/Roulette items. The cover of "Green Onions" on the otherwise dismissable Goes Memphis is a monster surprise.